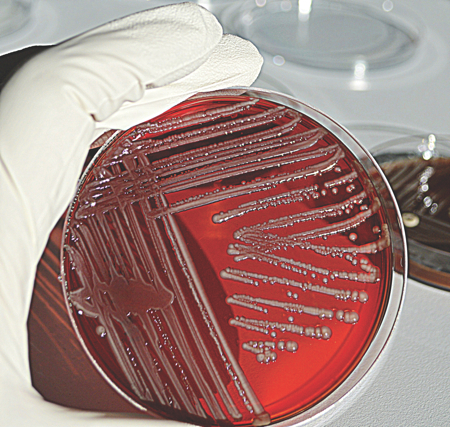 Microbial validation and release testing in industry often utilises commercially prepared stocks of standard test organisms to perform growth promotion (GP) tests. These preparations consist of a defined number of colony forming units (CFU) of the specific species maintained in lyophilised pellets or another stabilised format. Such preparations exhibit acceptable performance during their use in compendial methods (e.g. spread plate testing). This results as the CFU have sufficient time to pass from the lag phase into exponential growth, and thus develop into visible colonies for enumeration. 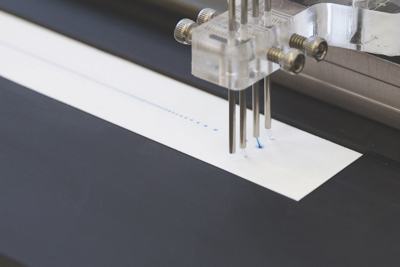 Rapid microbial testing systems are now available that drastically reduce the time-to-result for the analysis of test samples. With a shorter time-to-result, any variation in the duration of the lag phase of the test organism CFU may result in a perceived undercount of the CFU present in the sample. This would occur as all the organisms may not have reached a sufficient colony size for detection by the Rapid Microbial Method (RMM) at the end-point of the test. Commercial preparations are presumed to grow as well as those samples prepared in-house; however, their relative growth performance has not been compared previously. 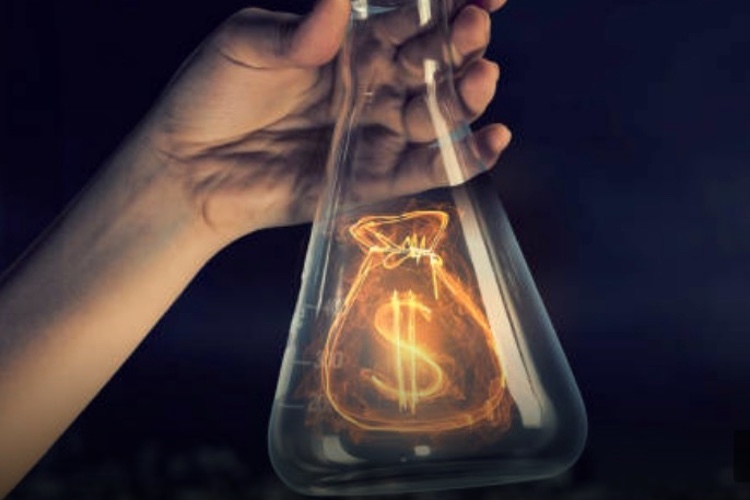 This study examined the growth promotion of a suite of USP recommended QC test organisms obtained from three vendors compared with an in-house culture made at Rapid Micro Biosystems (RMB). The growth promotion comparison was performed using the Growth Direct System. This is a rapid automated colony counter that utilises the bacterial cell’s autofluorescence when exposed to a blue light. The light emitted from the micro colony is captured on a charge-coupled device (CCD) camera. CCD images of the test agar cassette are taken every four hours, enabling growth events to be detected as changes in event size and registered as a colony forming unit (CFU). As the incubation progresses, the system records the total number of colonies seen and can generate a colony detection curve based on time. The colony detection curve gives an indication of how the lag phase and exponential phase change per sample, allowing different commercial control preparations to be compared. 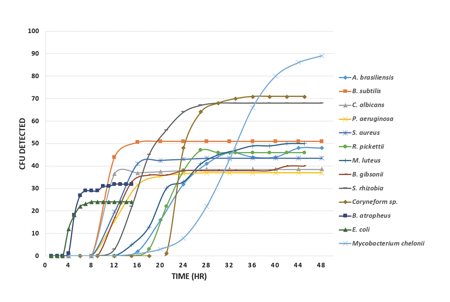 An example of a colony detection curve is shown in Figure 1 for a number of different species run on Tryptone Soya Agar (TSA). Test samples: The US Pharmacopeia (USP) organisms tested were Aspergillus brasiliensis ATCC 16404, Bacillus subtilis ATCC 6633, Candida albicans ATCC 10231, Pseudomonas aeruginosa ATCC 9027, and Staphylococcus aureus ATCC 6538. Commercial preparations used were: BioBall (bioMèrieux, Durham, NC), EZ-CFU (Microbiologics, St Cloud, MN), and Quanti-Cult+ (Remel, Lenexa, KS). In-house preparations of the bacteria and yeast consisted of overnight cultures grown in Tryptic soy broth (TSB) (32.5°C) and diluted in phosphate-buffered saline (PBS) to the appropriate concentration. A. brasiliensis was prepared as a spore stock suspension. Organism stocks were prepared following each manufacturer’s instructions. Growth Promotion Testing: All growth performance testing was carried out on the Growth Direct System using TSA Growth Cassettes from RMB. Briefly, prepared stocks of each sample were spiked into 20ml of PBS, and filtered through a Growth Direct Filtration kit, rinsed with 50ml of PBS and the membrane subsequently transferred to a TSA Growth Cassette and loaded on the Growth Direct System. 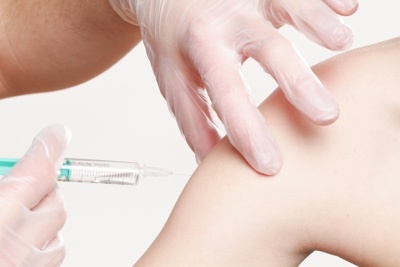 Aliquots were selected to obtain 30–100 CFU per replicate. Additionally, control spread plates were prepared for each test organism. Tests of bacteria and yeast samples were run at 32.5°C for 48h, A. brasiliensis testing was carried out at 22.5°C for 120h. 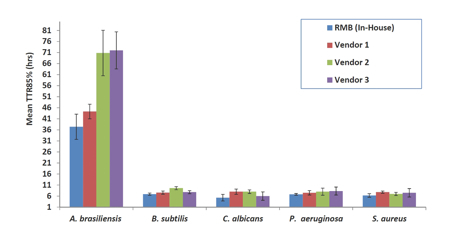 Results: Figure 2 presents the mean values for the TTR85% detection points (the time at which >85% of the colonies are detected on the system) for the test samples. The TTR85% essentially integrates the first detection time-point and detection rate to provide a measure of the overall growth performance of each strain. The in-house preparations exhibited the shortest TTR85% for the bacteria and yeast; all the colonies were detected very quickly, <10h to give quantitative results with no significant difference between the suppliers. A. brasiliensis did show a significant difference between suppliers with two preparations exhibiting a much shorter lag phase and exponential phase compared with the other two test samples. The slower growth characteristics of A. brasiliensis seem to accentuate the different recovery and growth performance of the organisms. In conclusion, this study compared the relative performance of USP organisms from three vendor preparations using in-house grown cultures as a benchmark. The in-house culture would be considered the ‘best’ performing population as the cells will be in either late-log or early stationary phase of the growth cycle. Thus, they would be able to start growing as quickly as possible and be more closely synchronised physiologically. This presumption was borne out, as the in-house bacterial and yeast populations exhibited the fastest detection rates. 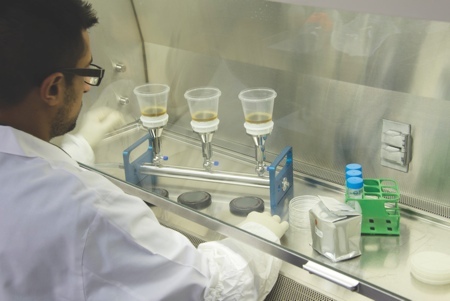 Of the organisms tested the A. brasiliensis showed significant differences between the in-house preparation and two of the commercial preparations. One supplier had results close to the in-house organism performance. It is hypothesised that the manufacturing process for the preparation leads to stress on the organism and affects its ability to recover and grow quickly. The method used by each supplier may have variable effects on the different organisms and lead to variable recoveries. Our data did not look at lot-to-lot differences within each company. With respect to moulds, validating a time-to-result for a rapid microbial method (RMM) may be problematic if the control organisms from one supplier were used to develop the method and another used for the validation. These data also indicate that whichever control was used to set the test end-point, this Time To Result (TTR) would be sufficient for testing fresh organism preparations; however, perhaps not for stressed organisms from the environment that would probably have a longer lag phase than test organisms prepared under controlled conditions. For most compendial testing applications wherein incubation is carried out for three days or more at 32°C, and longer at lower temperatures, such growth performance would not be a hindrance to obtaining an accurate end-result. For RMM there needs to be sufficient understanding of the possible delays caused by stress to setting the TTR and the use of commercial preparations for GP testing and the establishment of TTRs. Dr David Jones is Technical Services Director, Rapid Micro Biosystems, and Dr Andrew Sage is Manager, Microbiology Applications, Rapid Micro Biosystems.